New Testament Books Now Available! Back in 2011, Fred and Arlene Jonkman and their daughter came to Guatemala to do a number of workshops on the Sunday School Curriculum that they had translated into Spanish. you can read about this visit if you go back in my blog to 2011. The result of this visit was that WD funded the printing of the OT book at the end of 2012. Since that time I have been responsible for distributing these book. Over the years I sold around 450 copies of the OT book. At the beginning of 2017 I started looking into having the NT book printed since I had enough money from the sales of the OT books to be able to print the NT book. However, it took quite some month to get the printing done largely because we could not find the right file that I could give to the printer. After months of searching the correct file was found and I was able to get the NT books printed. Since November of 2017 we have 500 copies of the NT book available. 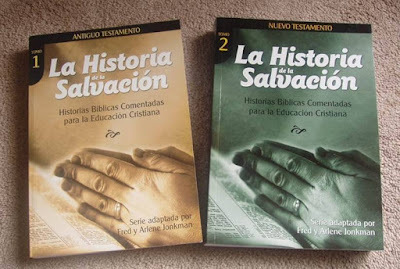 One of the focuses this year for me to use others who live in different parts of Guatemala to help with the sale and distribution of the books. One of the difficulties I have had in previous years is distributing the books in a cost effective way. I have met on several occasions with different leaders from the Presbyterian church who are willing to help with this. My hope is that if they do a good job, they can take over this ministry since I am leaving Guatemala in 2019. We are missionaries serving our Lord Jesus Christ in His Kingdom in Guatemala. We are working with Free Reformed Missions International (FRMI) and AMG International. We have been serving in Guatemala for over 13 years together with our four children Nico, Ellen, Jesse, and Tristan. 1.Country of Guatemala with all its spiritual, social, and political problems. 2.Local Christian leaders and missionaries. 3.Our family, our witness, and our needs. 4.The projects in Cubulco: Cubulco churches and the lay pastors, the translation team, the education projects; their teachers and students. 5.The AMG team and projects.